2016 is shaping up to be a benchmark year for furry movies. Though movies featuring talking or otherwise anthropomorphic animals are hardly uncommon, this year looks to be exceptionally full, and many of the movies coming out have impressive pedigrees. It should also be noted that there is a ridiculously high number of foxes featured, for those of us who find that important. Cartoon Brew has a list of 47 animated movies planned to be released next year, where most of these movies are drawn from; not all of them contain furry characters, but many do. There are also a few live action titles that can be counted on to be furry. Notably, 2016 release Zootopia's first trailer provided a list of unique features it contained, including bipedal, tech-using, clothed talking animals in a human free world; though these attributes are uncommon, if not actually original, 2016 will contain six movies that meet these requirements (Kung Fu Panda 3, Rock Dog, Sing, Sly Cooper, Spark and Zootopia). The following list is mostly aimed towards an audience living in the United States of America; release dates listed are American. Some of the movies listed do not have solid release dates, and may fail to be shown; others may have had release dates outside the U.S. earlier this year. Also, movies listed contain only anthropomorphic animal movies; movies featuring anthropomorphic characters not based on specific animals are not listed. The first international trailer of Pixar’s/Disney’s The Good Dinosaur, with the dinosaurs talking, has just been released. The captioning is in Spanish, but the voices are in English, as the movie will be released in U.S. theaters on Thanksgiving. Place your bets! Will 'The Good Dinosaur' feature migrating? After all the recent 2016 movie trailers last month, we're going back to the present of 2015 with this month's movie trailers. Though a teaser was dropped last month, Pixar's first ever second movie of the year, The Good Dinosaur, has a brand new trailer. It neither confirms nor denies the possibility of migration. At the recent Comic Con Experience in Brazil, Pixar president Jim Morris chatted up the crowd about Finding Dory, Pixar’s upcoming CGI film scheduled for release in June of 2016. Besides showing them lots of preliminary artwork and other goodies, he also gave the world the first inklings of the new film’s plot. Following the adventures of Finding Nemo (of course), this new film follows Dori (the royal blue tang who suffers from short term memory loss) as she journeys across the ocean in search of the marine research facility where she was born — and where her parents still live. Once again Dori will be voiced by Ellen DeGeneres, and her friend Marlin the clownfish (Nemo’s father) will again be voiced by Albert Brooks. No word yet if popular characters like Bruce the vegetarian-wannabe shark or Crash the oh-so-radical sea turtle dude will also make an appearance. But check out the article at Animation Xpress to find out what we do know now. Jerry Beck’s Animation Scoop website noted on December 18 that the Library of Congress’ National Film Registry has announced its 2013 selection of twenty-five new additions. Several of the films are animated, or contain animated sequences, and among those, several feature anthropomorphized animals. Josh Armstrong, on the Animation Scoop website, has advance news and an image of the Pixar TV Hallowe’en special, “Toy Story of Terror”. 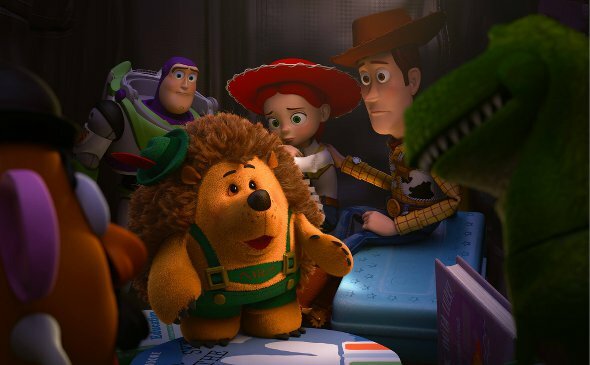 While the Toy Story crowd is technically anthropomorphic anyway, “Toy Story of Terror” includes an especially Furry plush hedgehog, Mr. Pricklepants. “Toy Story of Terror” was broadcast on ABC-TV on October 16 at 8/7 (Central) p.m. Here are two favorable reviews of it. The first, by Shaun Thompson & Craig Williams on the DIS Blog, is especially informative, and includes scheduled showings on Disney's channels. It looks worth watching on the inevitable reruns and DVD release, if you missed it the first time around. Well, enough of the doom and gloom, it’s a brand-new, shiny awards season. This month, let’s look at how the race is shaping up at the Oscars. Maybe we’ll even spare a thought for the Annies. The winners of the 13th annual Ursa Major Awards for the best anthropomorphic literature and art published in 2012 were announced July 5 at a presentation during Anthrocon 2013 in Pittsburgh. 1,113 people voted, a decrease of about 37.5% compared to last year. For the second column of the month, and the official one of this (well, now last) month, I’ll continue a theme from this time last year. It’s time for round two of Oscar snubs; furry style! Sorry for the delay, folks; I know all five of my regular readers were on pins and needles (hi, mom!). See, GreenReaper emailed to tell me that Fred had linked back to my Cinderella review on the new Cartoon Research site, and just like the time he emailed me about some video game site which quoted my Pokémon Black 2 and White 2 review, my computer died. Obviously, there's some connection here. Anyway, it's all their fault. Shame on you guys. 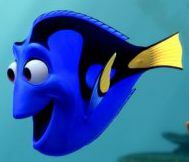 The Cartoon Brew reports that Ellen DeGeneres, who voiced Dory, the regal blue tang fish with short-term memory loss in Pixar’s 2003 Finding Nemo, has announced that Pixar has asked her to reprise her role in the forthcoming sequel, Finding Dory. It will also be directed by Andrew Stanton, who directed Finding Nemo. Its tentative release date is November 25, 2015. Finding Nemo is Pixar’s #2 grosser, behind only Toy Story 3. Video games: 'Disney Infinity' stars everybody! Cartoon Brew has a new 3’04” trailer for Disney’s forthcoming video game, Disney Infinity, coming in Summer 2013, that apparently has every Disney and Pixar character in it that are not already in the other Disney “team” video games such as the core funny animal stars and the Princesses. Anthropomorphic characters? Plenty of 'em!